Editor’s note: This is the second in a five-part series comparing a range of cars leading up to prime buying season. WASHINGTON — Sport Utility Vehicles aren’t the only option for car shoppers who want something useful. And for the most part, SUVs don’t really offer much in the way of sportiness. For those who want something different as the end-of-year car-buying season ramps up, there are some sporty cars that come complete with a rear hatch, making them more fun to drive than an SUV, but still plenty practical for a Costco run. WTOP’s John Aaron and Mike Parris tested the Audi S5, the Kia Stinger GT2 and the Hyundai Veloster R Spec and detail the pros and cons of each — as well as which ones you should get behind the wheel of. 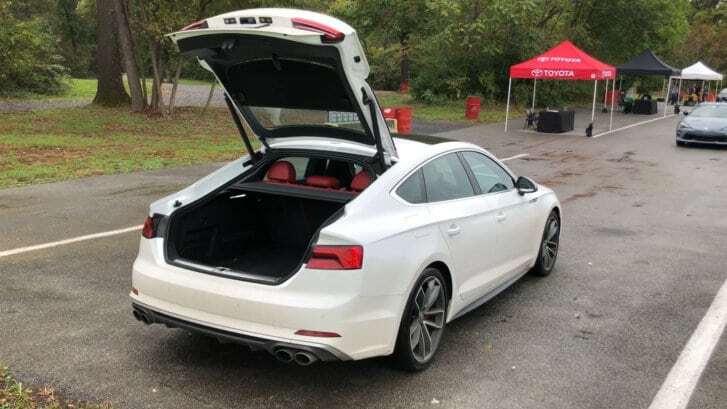 Pros: Audi’s popular and highly regarded A4 sedan gets a rear hatch instead of a trunk lid, along with the S performance treatment. The result is a great handler with a superior all-wheel-drive system. The S5 has a sharp, albeit flashy interior filled with sporty-looking carbon-fiber accents and soft diamond-pattern red leather seats. Cons: As is often the case with German cars, the pricey options pile up. (The S5 starts at $52,400.) Despite its 349 horsepower V6 that Audi says will shoot the car to 60 miles an hour in 4.5 seconds, the car does not feel otherworldly fast.